a Circle Theorem called the Thales' Theorem or Triangle inscribed in semicircle or Angle inscribed in semicircle or “90 degrees in Semicircle” Theorem. how to use the Thales' Theorem to find missing angles. how to prove the Thales' Theorem. 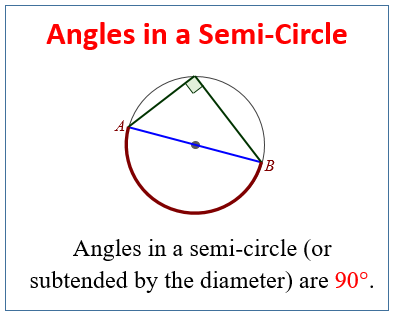 Every angle subtended at the circumference by the diameter of a circle is a right angle (90˚). The diameter of a circle always subtends a right angle to any point on the circle. The angle inscribed in a semicircle is 90˚. The following diagram shows the Thales' Theorem: Angles in a semi-circle are 90°. Scroll down the page for more examples and solutions. Thales' Theorem: If the longest side of a triangle inscribed within a circle is the same length as the diameter of a circle, then that triangle is a right triangle, as well as the converse: if a right triangle is inscribed within a circle, the length of its hypotenuse is the diameter of the circle. We can use the Thales' Theorem to find missing angles. This proof uses the bow theorem.